Basso et al. 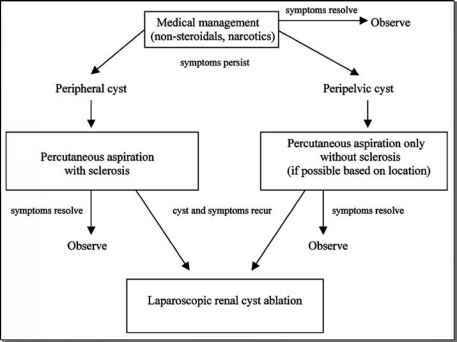 initially described direct left-sided supragastric laparoscopic adrenalectomy (13). With the patient in the lithotomy position, the gastrophrenic ligament and one or two short gastric vessels are divided, thereby allowing displacement of the gastric fundus inferiorly and exposure of the diaphragmatic crus. The constant tributary from the inferior phrenic vein, the so-called "diaphragmatic-adrenal-renal channel," is identified and divided and traced to the adrenal vein, which is then transected. All six procedures in this series were successfully completed. Vereczkei et al. described a similar approach wherein initial access to the adrenal gland is afforded by incising the leinodiaphragmatic ligament laterally from the left diaphragmatic crus, allowing the spleen to be retracted inferiorly and laterally. The gland is dissected along its medial and then inferior aspects, and the main adrenal vein then identified and divided (14). In this series of 23 cases, however, three required conversion owing to intraoperative hemorrhage, and one case of pheochromocytoma was complicated by intraoperative hypertension secondary to gland manipulation prior to venous control. Both of these approaches aim to minimize visceral mobilization and allow direct access to the adrenal gland; however, because the adrenal vein is accessed only after dissection of a large part of the tumor, these approaches are not suitable for removal of pheochromocytomas (5).